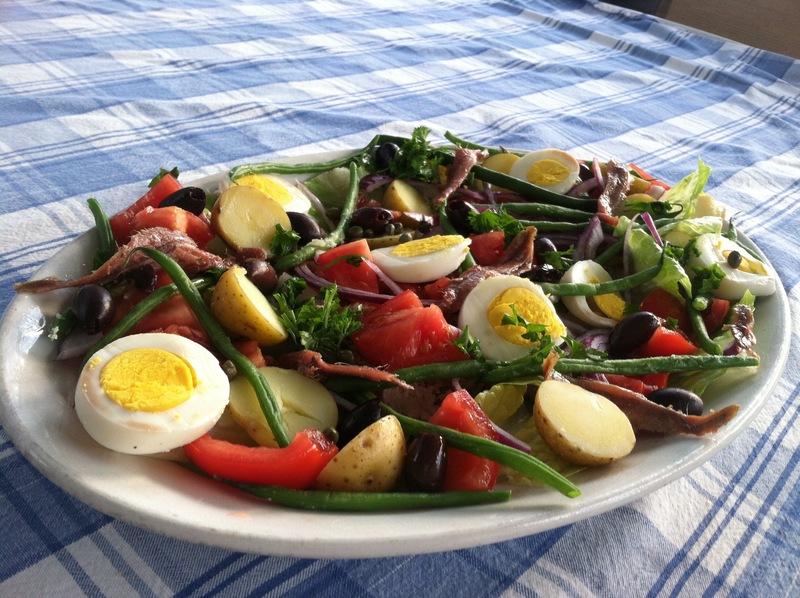 Rick’s salade niçoise | When I Survey . . . Some cooked small potatoes such as Yukon Gold sliced. Whisk the dressing ingredients and put it aside. Assemble the salad on a platter starting with the greens, the tuna, the potatoes, the beans, the egg slices, the onion, the tomatoes, the anchovies, the capers and herbs. Drizzle with the vinaigrette, a few turns of the pepper mill, and serve. (Photo: © R. L. Floyd, 2015) If you see an ad here it is WordPress doing their mercantile thing, over which I have no control. This has always been, and will continue to be, a non-commercial site. This entry was posted in Cooking, Food, French cooking and tagged French food, salade nicoise, salads. Bookmark the permalink.